Can we handle our e-waste? India is the fifth largest producer of e-waste in the world and has discarded approximately 18 lakh metric tonnes of e-waste in 2016, which is 12 percent of the global e-waste, according to a United Nations University study, ‘The Global E-Waste Monitor 2017’. In fact by 2020, India’s e-waste from just old computers and mobile phones will rise by 500 percent and 1,800 percent respectively, as per a study by KPMG and ASSOCHAM. Experts say that e-waste is becoming an insurmountable challenge, given the country’s poor capacity in its safe disposal. In 2016, the government introduced e-waste (management) rules to fix the responsibility of producers in collecting their end-of-cycle products and ensuring their proper disposal. It was referred as extended producers responsibility (EPR). The collection targets for producers were kept at 30 percent in the initial two years from 2016 to 2018 and 40 percent during 2018 to 2020. It also introduced the concept of producer responsibility organisation (PRO), which would take the responsibility of a group of producers for the collection and channelisation of e-waste to ensure its safe disposal. But the industry has not been able to meet these targets. Majority of the e-waste collected in the country is managed by the informal sector. “The informal channels of recycling/ reuse of electronics such as repair shops, used product dealers, e-commerce portal vendors, etc. 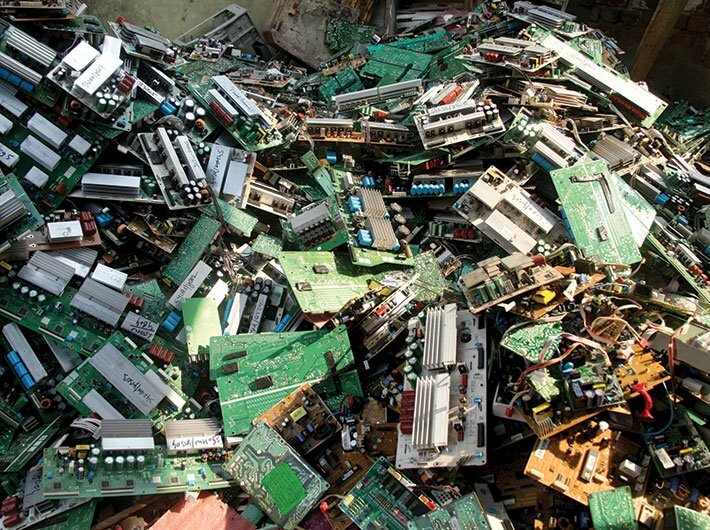 collect a significant proportion of discarded electronics for reuse and cannibalisation of parts and components… managing an unorganised sector to achieve such high targets may not be feasible,” noted the KPMG-ASSOCHAM study. Subsequently, the ministry of environment and forest and climate change brought out draft e-waste rules in 2017, which diluted these targets — with 10 percent collection in 2017-18, 20 percent during 2018-19, 30 percent during 2019-20 and 40 percent during 2020-21. Only time will tell if even these diluted targets would be met. At present, there are some major issues hampering proper recycling of e-waste. It includes lack of awareness around safe disposal of electronic goods and appliances, poor industry outreach, and monitoring and enforcement of work by registered recyclers, where allegedly most pilferage happens — the waste is sent to informal channels for disposal wherein it is done in a hazardous manner. The Central Pollution Control Board (CPCB) claims to have registered 178 units as dismantlers and recyclers with a total disposal capacity of 4,38,085.62 MTA (million tonne per annum). Experts, however, put the number of responsible recyclers, who follow safe processes for disposal, in a single digit number. Moreover, the informal sector of waste recyclers is infamous for employing children. According to the UN University study, one million poor in India are engaged in informal recycling operations. “Most of these people have low literacy levels with little awareness of the dangers of the operations. Severe health impacts and environmental damage are widespread in India, due to the final step of the e-waste processing by the informal sector,” said the study. However, the increasing amount of e-waste in the country has an inherent opportunity. The UN University report also termed e-waste as a ‘toxic mine’ and a ‘gold mine’, simultaneously. On one hand, it contains heavy metals such as mercury, lead and cadmium and chemicals like CFC or flame retardants. On the other, it contains valuable materials such iron, copper aluminium and plastics. It also contains precious metals such as gold, silver, platinum and palladium. “Up to 60 elements from the periodic table can be found in complex electronics, and many of them are recoverable, though it is not always economic to do so presently,” the study said. However, in the absence of formal ways of treatment and disposal, valuable materials are easily lost. According to the study, the estimated worth of valuable materials including precious metals in 2014 was 48 billion euros. To safeguard people’s health and harness its potential, it is imperative to have policies which create formalised infrastructure for e-waste disposal, the study suggested.